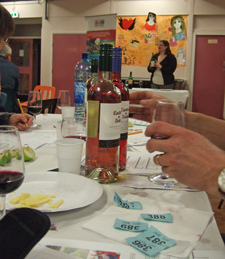 Just42, a youth work charity in Woodbridge, organised a wine tasting as a follow-up to Fairtrade Fortnight. One example of the advantage of Fairtrade certification is demonstrated in the Fairhills vineyards of South Africa set up in 2005. The Fairtrade premium has helped build schools, daycare and community centres benefitting the 1,000 Fairhills workers and their families. Of the 25 guests present at the tasting, many were complete novices yet Jude soon had us commenting on the wine’s ‘appearance’, ‘nose’ and ‘palate’. We learned that a red wine could be clear, a nose could be clean and that a wine could be ‘long’, ‘medium’ or ‘short’ (this relates to the length of time the taste lingers). It was a fascinating evening and Jude commented that there was something suitable for any occasion, barbecue, aperitif or even a wedding in the case of the Sparkling Brut. Wine tasting usually involves seeing, swirling, smelling, tasting and not swallowing but the wines were so good the ‘not swallowing’ bit was ignored! Personal favourites were the Sparkling Brut from the Co-Op (£7.99 a bottle) and the Fairhills Petit Verdot from Tescos (£4.49). 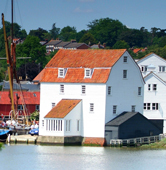 “I would be happy to have any of them again” said Chairman of Fairtrade for Woodbridge, Anthony Lumley. Fairtrade for Woodbridge are grateful to Just42 for organising and hosting the evening, to Jude for travelling up from London to teach us and to Budgens, the Co-Op, Wines of Interest (Ipswich) Adnams and Tescos for supplying wines.